Unlike with the previous Biscuit book, even I was able to identify the two main characters of Biscuit and the Bunny by Alyssa Satin Capucilli. A cute grey bunny and adorable yellow dog stare at each other playfully on the front cover. As with all books in the Biscuit series, the title is written in a whimsical font against a solid background. Biscuit (who I’ve since learned is the cute dog) meets a bunny under a lettuce plant. After coaxing from his owner, Biscuit and the bunny become friends. 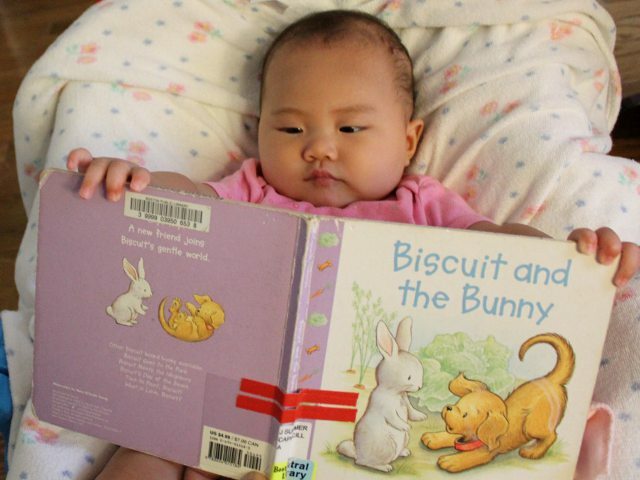 The story of Biscuit and the Bunny is simple, but interesting enough to entertain most children. With less than ten words on each pair of pages, preschool-age children should be able to get through most of the book on their own. The illustrations, by Pat Schories, emphasize the large eyes and cute faces of the little girl–Biscuit’s owner–Biscuit, the bunny. Although the girl seems almost too happy in every picture, Biscuit is particularly well drawn. I especially enjoyed the picture of the cute dog rolling on his back. Arya liked the colorful drawings throughout the book and she also liked my sad attempt to mimic Biscuit’s barks. She didn’t react to the book quite as much as she does with her favorites, but she did happily sit through the entire text. Children whose families have a dog will relate more to the pictures in the book. Biscuit engages in identifiable doggy behavior including playing fetch, rolling over, and assuming the play position. The bunny, while also cute, is not as memorable. Nonetheless all children will at least smile at the happy ending to the story. Biscuit and the Bunny is currently out of print, but used copies cosst (including shipping) $3.99 from Amazon.